A few people have said to me that I'm lucky because E will often happily play alone. I think I probably am lucky but (and I may be alone in thinking this) I'm also of the opinion you have to show children how to play - you can't just dump them on the floor with toys in front of them when they don't know what to do with them. This may sound obvious but I know of at least one Mummy that has done this. When E was young I would get down on the floor with her and show her the different toys and what they did and then let her play with them. I would start off sitting with her on the floor and then, once she was happy, gradually move away from her. E loves putting things together and taking them apart. Her Nanny and Grandad brought her some simple stacking cups and I swear they were the only thing she would play with for weeks and weeks. 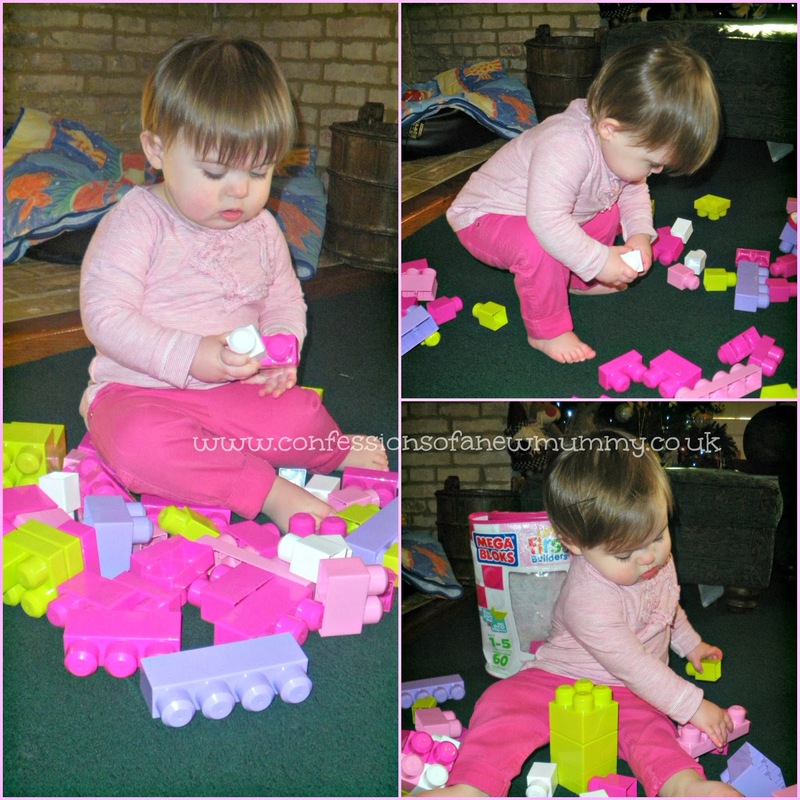 One of the things she currently loves playing with is her Mega Bloks. Oh my! I was told that Mega Bloks were a winner with most children but I really had no idea. We brought E some for her birthday back in August and she's recently started to get into them. To start with, she didn't show a huge amount of interest in them - she was happy for me to put them together for her to pull apart. I think I played with them more than she did! Now though, its a different story. She will grab the bag and drag it over to me to open for her. She will play with them for at least 40 minutes on her own (brilliant for a 17-month old, I think) - building them together, pulling them apart, putting them in the bag and throwing them back out again! We don't keep them out all the time, the bag is kept in the hallway. This is so that she doesn't get bored with them and (I know how controlling/dreadful this makes me sound!) so that they all stay together and no bloks go missing - there's nothing worse than finding bits under the sofa or opening a toy and half the parts are missing. Its one of my bugbears! I love that they're so bright and chunky, its almost impossible to accidently step on a piece! All in all, they're a huge hit in our house. I can't wait until she starts to build bigger items and to see her imagination coming to life. Just to be clear - this is not a sponsored post. This is an item we love and wanted to share with you. My youngest is 6 and still loves her mega bloks!